The women's Aquaflo Plus top has served a long-time customer favourite having been in production for seven years. The top is designed with Zone3's Aquaflo technology which, through a Teflon coating, boosts hydrodynamic performance by repelling water off the top. This also helps to ensure less water is absorbed meaning the top stays lightweight and comfortable. 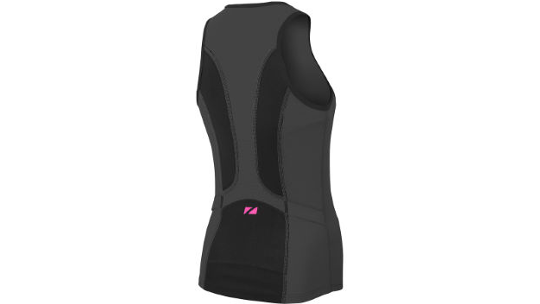 You will also find a built-in inner bra that adds extra support for the run. Made from a high denier fabric, the inner bra is extremely comfortable and highly durable. Finally, Airflo technology ensures sweat is quickly wicked away from the material leaving you feeling cool, comfortable and ready for anything. Aquaflo technology designed to give you low levels of drag thanks to its water repellent Teflon coating. This hydrodynamic effect is maximised during the swim helping to achieve faster times. It also means less water is absorbed making the suit lighter and quicker to dry once on the bike. It is made from Xtra-Life Lycra® which ensures great shape retention and comfort throughout the race. This technology is designed for optimum temperature control by allowing moisture to easily evaporate from the skin and help keep the body cool or warm depending on the conditions. The soft-touch feels extremely comfortable against the skin and the eyelet pattern also helps the fabric to dry very quickly after the swim. The inner bra is designed to give extra coverage. It is made from a high denier strength Lycra fabric to ensure comfort. The inner layer allows you to use the main suit zipper on the front for increased ventilation without exposing too much chest.